The high-intensity light ion source, Silhi, developed as part of the Iphi project, has demonstrated its efficiency for producing intense proton (H+) beams with good qualities and a long lifetime. For example, the source operated for 160 hours at 100 mA with a 99.9% availability, thus proving its reliability, which is one of the main objectives of the Iphi project. Encouraged by this performance, we developed two new sources based on the same principle: the plasma is generated by electron cyclotron resonance (ECR) at a 2.45 GHz radio frequency. Signal observed on an oscilloscope during 10 kV polarisation of the H- source to extract the beam. Electrons and negative ions are separated using a dipole magnet. For the Spiral 2 project, a source planned for continuous deuteron (D+) production has been designed at SACM. It is under construction and will be tested in 2004 on the Silhi beam line. Use of permanent magnets allows further increase in reliability and reduction in power consumption, as well as facilitating production. The only drawback is the rigidity inherent in the tuning: the magnets have to be changed or moved to adjust the magnetic configuration. The 5 mA requested Spiral 2 source intensity is rather low and the tuning tolerances are large enough to authorize permanent magnets utilisation. Their advantages therefore speak largely in their favour, in opposition to the Silhi source, for which necessary tuning is very precise. The chosen material is neodymium-iron-boron, which produces a strong magnetic field with a hysteresis cycle sufficient to avoid demagnetisation. The life of these magnets is considerably greater than the source one. There is a parallel ongoing study of a pulsed negative hydrogen ion (H-) source. 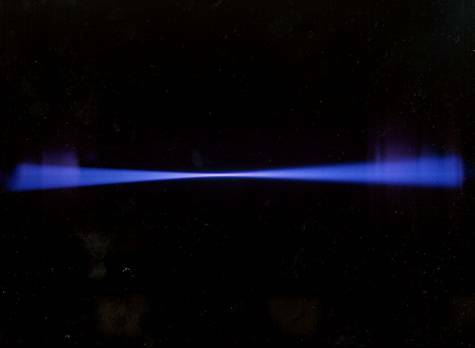 In 2001, spectrometry analysis showed the presence of excited-state hydrogen molecules within the plasma capable of producing H- ions by dissociative attachment. The first ions were observed at the beginning of 2002. In 2003, after the installation had been moved, the number of H- ions was greatly increased by separating the plasma chamber into two parts with a stainless steel grid. The role of the grid is to reflect the radio frequency wave, which is not absorbed by the plasma. As a result, it limits electron heating in the area near the extraction hole. The optimisation of the grid potential and the plasma electrode potential, at the same time, allowed to adjust the energy of the particles entering the so-called production zone. Thereby the negative ion intensity increased. 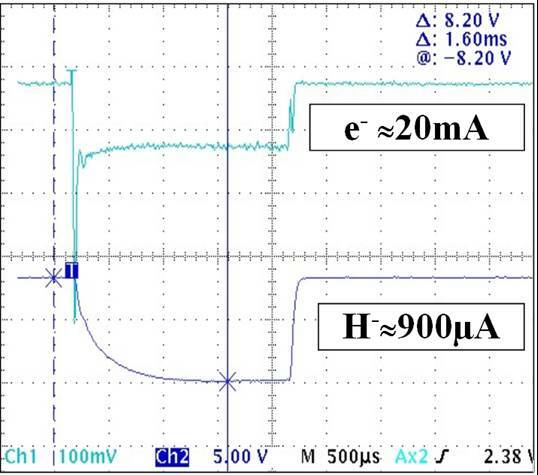 The maximum current has reached 900 µA of H- ions for 20 mA of electrons with a radio frequency power of only 1 kW. The final aim is to produce several tens of mA at 50 or 60 kV with the requested characteristics to inject the beam into the first stage of an accelerator. Study of the negative ion source is being carried out under the auspices of the European High Performance Negative Ion Sources (HP-NIS) network. Dapnia/SACM is coordinator of this network, where 9 European laboratories are involved. The 4 years programme covers the period from January 2002 to December 2005.